More than a year after a release, Electronic Arts is still adding new stuff to last year’s Star Wars Battlefront II. Granted, Battlefront II did not enjoy a good release – players the world over were upset with the microtransaction system EA had in place for the game (which had to be scrapped at the last minute), while its sales were quite a bit below those of 2015’s Battlefront game. But while this was never a bad Star Wars game to begin with as we pointed out in our review, EA has soldiered on and kept making improvements to Star Wars Battlefront II since its release last year. And now with the addition of new game modes, characters and better balancing of its game modes, it might just be the time to return to the game again. Actually, the game will be getting a big update next week as EA has revealed on its website, the highlight of which is the addition of one iconic Star Wars character to the game. This is none other than Obi-Wan Kenobi, the bearded Jedi master who’s the protagonist of the game trailer below. You’ll be able to control Obi-Wan in several of the game’s modes, including its Galactic Assault mode, which is also getting a new map next week. Galactic Assault is a 40 player mode which pits two teams against each other, typically in attack and defend roles. And this new map is set on Geonosis, a planet which featured in George Lucas’ prequel movies. 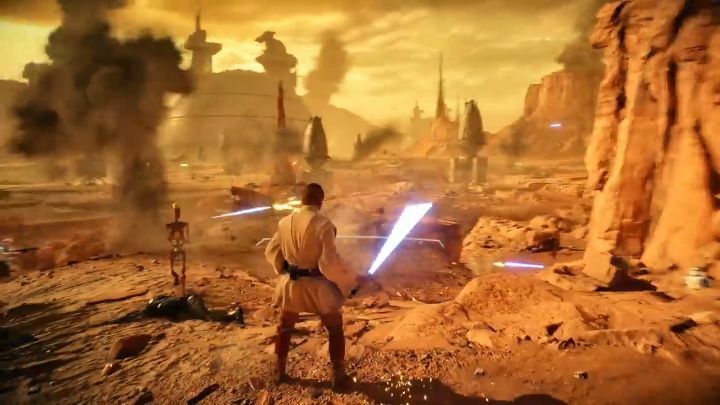 Here you’ll be able to play the Battle of Geonosis seen in Attack of the Clones, taking part as one of the sides involved in the battle. And not only does look like this could be another beautifully detailed location in the game, but to add authenticity to the proceedings, three new vehicles have been added to the mix: the STAP, BARC speeder and AT-TE. The first is a ground walker (similar to the AT-AT) used by the Galactic Republic, the second is a speeder similar to those seen in Return of the Jedi, while the AT-TE a one-person vehicle which hovers above the ground. This update will be free to anyone who owns Star Wars Battlefront II, while another good thing is that EA isn’t done yet adding new content to the game. Anakin Skywalker is coming to the game next year in another free update, plus another new game mode and new appearances for the game’s characters are also in the pipeline. There’s plenty to look forward to for Star Wars Battlefront II players in the months to come then, especially if EA’s new additions to the game cut the mustard and make playing this game a better experience than it has been to date.